Dr Joanne Connolly BSc, BVSc, PGCertTer Tchg, MRCVS, PhD Following my graduation with a BVSc from Sydney University in 1990, I worked for several years in mixed animal practice in Tasmania and then small animal/dermatology practice in Brisbane giving me a broad range of veterinary experience. 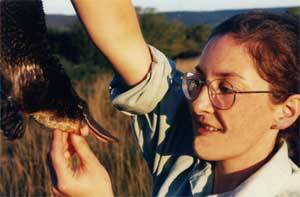 In 1994, I obtained funding for a twelve-month investigation into the ulcerative skin disease of platypus based at Department of Primary Industries and Fisheries in Tasmania. This was followed by a PhD on the immunopathological characterisation of infectious disease in the koala and the platypus at the University of Sydney. I lectured veterinary microbiology at Sydney University in 1999, and then lectured in veterinary bacteriology and mycology at Massey University, New Zealand from 2000 - 2003. Since returning to Australia in 2004, I taught into the Principles of Disease subject at Sydney University and then coordinated the Captive Vertebrate Management Program at Charles Sturt University in 2005. In 2006 I was appointed as Senior Lecturer in Veterinary Microbiology at CSU. My academic interests include veterinary microbiology and pathology, public health and wildlife disease. My previous research has included mucormycosis in the platypus; lymphoid neoplasia, cryptococcosis and chlamydial disease in the koala; epidemiology, pathogenicity and immunogenicity of the Salmonella Typhimurium DT160 strain in animals; Campylobacter spp. in cattle, poultry and dogs; and Salmonella infections of marine mammals. More recent research interests have included platypus population health in the Murrumbidgee catchment NSW and Tasmania; the Theileria haemoparasite in the platypus; Salmonella and faecal parasites in pythons; and photosensitisation in kangaroos.